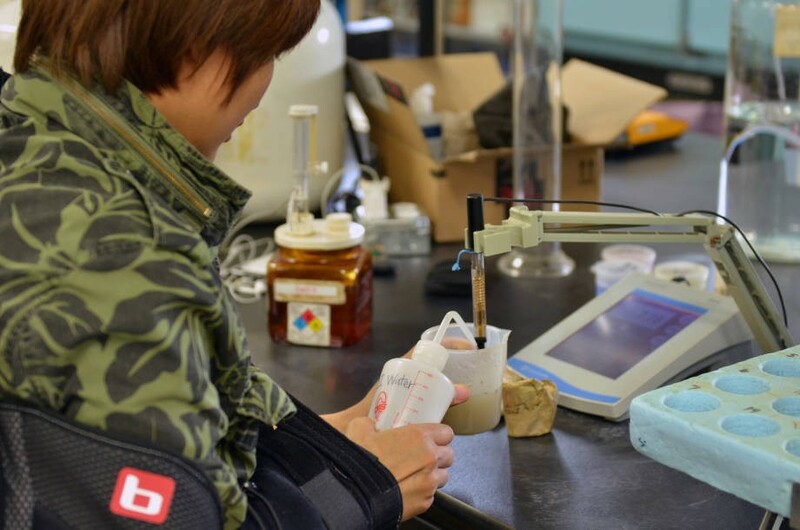 Saranya Norkaew, a graduate student studying soil science, tests the pH of a soil sample. Images courtesy of CAFNR News. 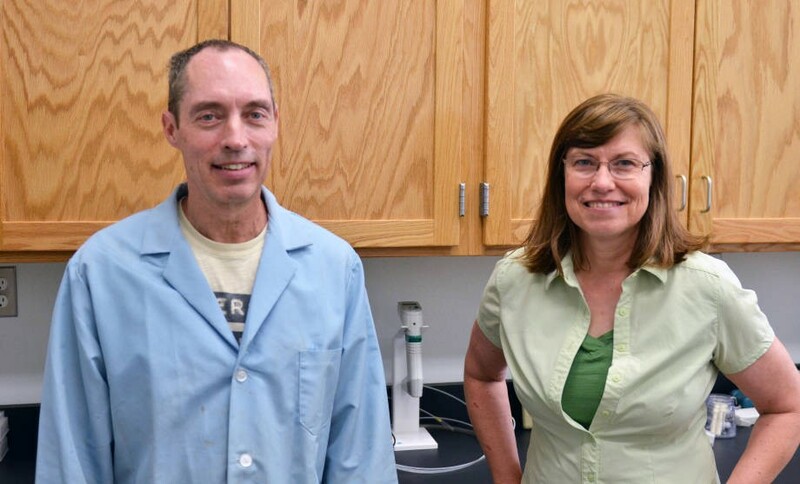 Russell Dresbach and Donna Brandt oversee the operations of the Soil Health Assessment Center at the South Farm Research Center. 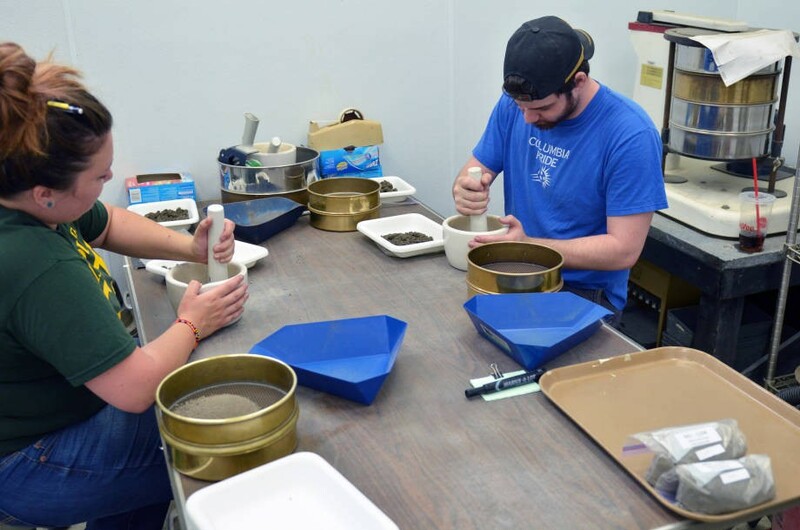 Undergraduate research assistants Megan Flatt and Michael Schoelz use pestle and mortar devices to break down soil samples into fine granules in preparation for testing at the Soil Health Assessment Center. To some, it’s a freezer bag stuffed with soil. To those who run the College of Agriculture, Food and Natural Resources’ Soil Health Assessment Center, it’s the lifeblood of a national initiative to analyze the organic matter quality of soil that could reap significant dividends for Missouri farmers and landowners. Traditional soil testing practices — checking the levels of nitrogen, phosphorus and potassium, for example — date back to the 1840s. The work that Randy Miles and his staff have been doing for the last three years at the center represents a movement that is essentially a few weeks old by comparison. “We’ve done a good job of assessing the physical and the chemical properties over the years. Now it’s the biological assessment,” said Miles, an associate professor in soil science at CAFNR who also serves as the director of the Sanborn Field and Duley-Miller Research Plots. As part of the five-year initiative spearheaded by the Natural Resource Conservation Service, the assessment center has received recent funding from the state office of the NRCS as well as the Missouri Department of Natural Resources. The DNR has recently placed additional emphasis on the testing by making it mandatory for those farmers and landowners who take part in its cost-share program. Within the next couple of days, the program will be begin to be partly funded through the Missouri Parks & Soils Sales Tax (one-tenth of one percent), which also helps fund the maintenance of state parks. By researching active carbon and overall microbial activity in soil, the center hopes to be able to make more informed recommendations on possible cover crops or other factors that could stimulate plant growth and lead to healthier soil. Other benefits of this new approach could less erosion and runoff, and therefore, a cleaner water system by reducing sedimentation in rivers and streams.